According to the exile Kirti monks, Lobsang Tsultrim attempted to walk along the main street towards the office building of the Forestry Department before he fell to the ground, and armed police emerged and extinguished the flames. A local Tibetan told the Kirti monks in Dharamsala that Lobsang Tsultrim was still alive when police took him away. He is believed to have been taken to the local government hospital, and then removed elsewhere. His current whereabouts and welfare is not known. Lobsang Tsultrim was born in Ryiwa village, Cha Township in Ngaba, and he joined Kirti monastery when he was very young. He was a classmate of Phuntsog, who self-immolated on March 16, 2011, and is said to have loved playing basketball. 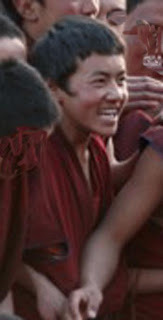 Lobsang Tsultrim is said to have suffered a great deal and may have been detained following the crackdown in Ngaba from March 16, 2008, when at least ten Tibetans were killed by Chinese troops after peaceful protest. He is the 27th Tibetan from Ngaba to self-immolate since February, 2009, and the eighth Kirti monk to do so.